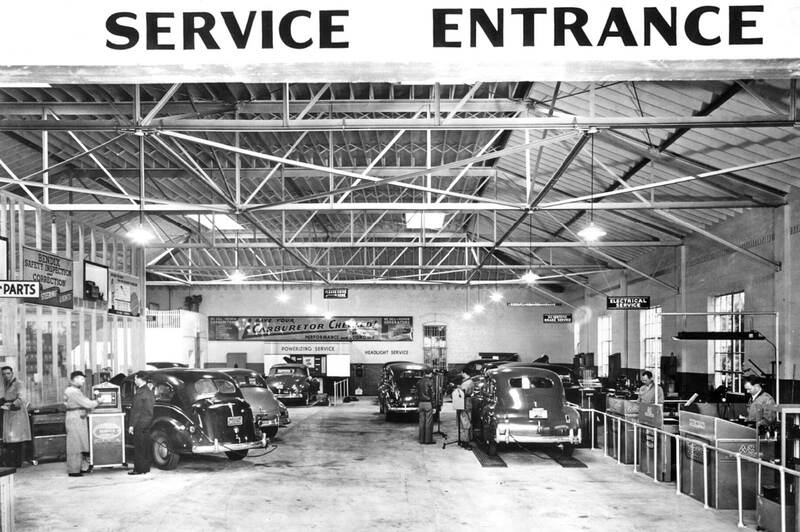 Clean, neat, large and well-equipped independent automobile repair shops, in general, have always been few and far between, but Bob Deriso’s United Motors service and repair garage located in Tampa, Florida, was one of the exceptions. Situated at 1010 Marion Street between Tyler and Harrison Streets in the City, Deriso’s shop was across street from Elke’s Pontiac sales and service. United Motors was first formed in 1916 by automobile industry deal-maker and tycoon Billy Durant as a the owner and supplier of several auto electric, roller and ball bearing companies, and a manufacturer of wheel rims. Durant wisely selected Alfred Sloan as the president of the new auto parts supplier to car and truck manufacturers. In 1918 the General Motors acquired the Company, and it was then designated as the United Motors Division of GM. Later the firm also supplied parts, branded service equipment, and signage to independent repair shops that signed up and became outlets for the Division’s auto parts manufacturers. Bob Deriso apparently had this building constructed in the 1930s and signed up with United Motors to be his parts and equipment supplier. 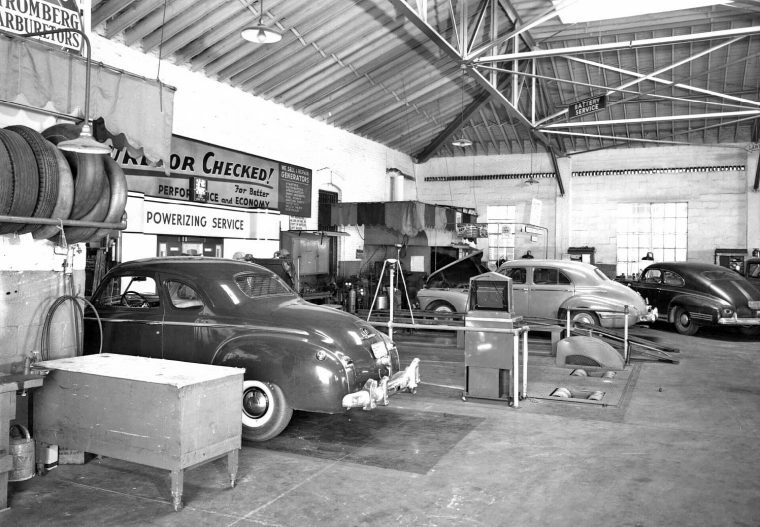 Today’s feature photos of the service repair garage were taken in the early post-WWII period. Share with us what you find of interest in the enlargeable images below by Robinson and French courtesy of the University of South Florida at Tampa. 1940s Chevrolet sedan delivery parked inside of the service entrance in front of the service writers desks. A view of the interior of a portion of the service area and the component repair department on the far-right. The “Powerizing Service” department and chassis dynamometer used for checking power output after repairs had been completed. 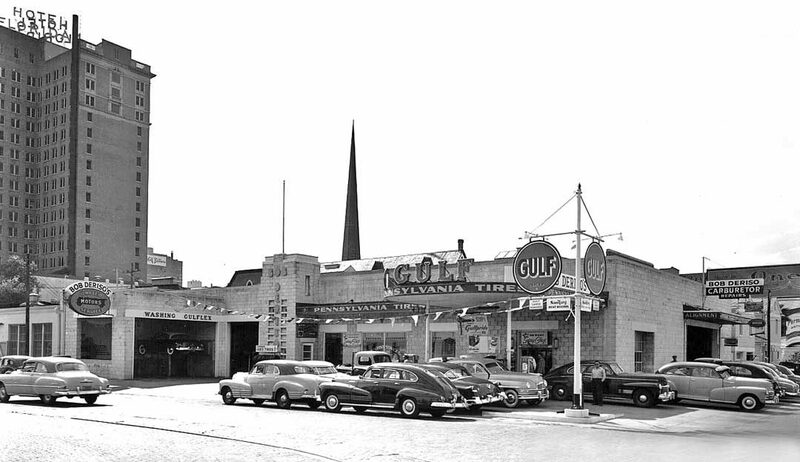 In the lead photograph, at the fuel pumps, facing right, is a light colored, four-door, 1950 PACKARD [non-Custom model]. In the same picture, parked on the sidewalk beside the ’50 PACKARD, is a 1950 CADILLAC Series 62 Sedan, and forward of the ’50 CADILLAC is a late 1940s STUDEBAKER Starlight. I was a service writer for about 12 years. I would’ve MUCH rather have that in the 40s-50s than the late 70s-early 80s. Our jobs were too cut-throat, and the pressure to sell ruined the position. Glad that chapter is behind me. Wow! A chassis dyno. That was a big investment especially for an independent shop like this. The equipment, organization and cleanliness reflect the quality of repairs and indicate how this business was managed and why it grew. Today it would be hard to find the technicians with the skills needed to support this diversified garage at the high level it appears to be operating at. Great story and great photo’s. Thanks! In the 3rd photograph, 2nd car on the left, is a 1st generation, four-door, PACKARD Clipper. In the 4th photograph, center background, is a light-colored 1941 BUICK [with hood open], either a Roadmaster or Super sedan. Robert Floyd Deriso was born in 1905. The earliest mention I could find in a quick search of newspaper articles was 1941, but the article said he’d been open for a while. Bob provided equipment for the Florida Sheriffs Boys Ranch to add an engine diagnostic center to their mechanics’ shop in 1972. He retired in the late 70s or early 80s, according to a 1983 article about his work with the Shriners (it states he retired “a few years ago,” hence the imprecision in dates). He passed away in 1990, and his wife passed in 2001. Half of their estate was bequeathed to the University of Florida College of Veterinary Medicine, and he must have been rather successful, since that half was valued at $1.3 million. The sedan delivery appears to be a 1946-48, and looks pretty new, somebody was proud of her, and “Scientific Brake Service”? Wow! In the 4th picture, in the foreground left, is either a 1946 or ’47 PLYMOUTH Special Deluxe Coupé, with white plastic beauty rings. The car has some “up-grades” – venetian blinds in the rear window and an extra set of bumperettes. 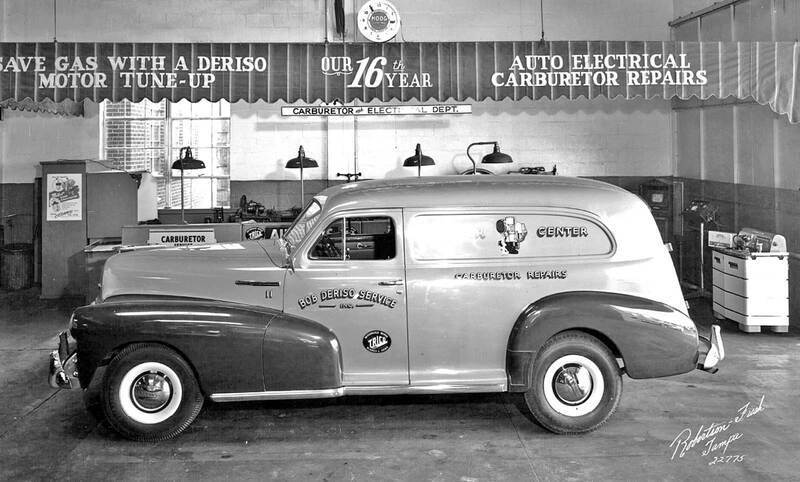 David, the photo of the Chevy sedan delivery has me wondering…is the s.d. body longer than the chassis they were set on ? Look at where the wheels are in both wheel wells. Curious. Hi John, I read, the sedan delivery was just a station wagon without windows or back doors, and later, the panel van was on a truck chassis. If you look at ’48 Chevy wagons, they seem to have that same wheel well thing. My eye was drawn to the low-slung car on the lift in the first photograph. From the rest of the cars, the photo looks to be ’50 or ’51 at the latest. Whatever it is, it stands out compared to its more stately compatriots. It looks like a 1950 Buick Special 4-door sedan, the only year they used that body shell for the 4-door. Same shell was used for the Oldsmobile 98 4-door for ’50 and ’51. I can see that, Joel, thanks. I think my eye was fooled because I couldn’t see the hood line beyond the front fender line. It makes the car look sleeker than it actually was. The trunk line looks lower, too, but that might be a matter of perspective. Actually, Joel, David… Buick used it in the Super and Roadmaster, also Cadillac in the Series 61, as well. Yes, the Cadillac Series 61 was on the same shell — that “C” pillar is quite distinctive — but I disagree on the Super and Roadmaster. Graham, I withdraw my previous disagreement about the Super and Roadmaster. I was unaware of the Super Touring Sedan Model 51 and Roadmaster Touring Sedan Model 71. Thanks to AML for bringing them to my attention in the May 16 follow-up article . I think that’s a 49-50 Pontiac and 49-50 Packard in the first photo. Another Ballantine Blast right outta the ballpark. That place is a parking lot now.The church in the background got a makeover and lost its steeple.A lot of churches have torn down their steeples as they are costly and difficult to maintain. The Hotel Floridan was briefly an SRO but they ran all the degenerates out and then spent lavishly. So you got a dyno test with every tune-up I guess. Looking through some Tampa, Florida city directories, I was able to find some work history for Bob Deriso. In 1931-1932 he was an Assistant Manager at the Fred Ferman Co. By 1933 he was the Service Manager at Ferman Chevrolet Company at 307-11 Florida Ave. In 1934 he was the service manager at Schlecht’s Garage & Service Station at 602 Cass (corner of Morgan) which sold Shell Gas & Oil and Goodyear Tires. By 1935 the name of the business had changed to Schlecht-Deriso Garage & Service Station still at 602 Cass. His business partner was Walter A. Schlecht. And finally in 1936 this station became Bob Deriso Service, Inc.
Nowadays UMS is known as ACDelco. That was 3rd foto …Next foto, left to right is postwar Plymouth w/ extra overriders on rearbumperand a ’41 Buick Torpedo Sedan… Buick was the only car to use that hood which could open from either side, the same body was used by Cadillac, Pontiac and Oldsmobile in 3models, another sedan w/ 6 winndows ea side and finally a fastback coupe … the ’41 Pontiac shown… Uncle Bobs shop was quite the place offering everything from soup to nuts. I grew up in Tampa and worked for Ferman Chevrolet . It is one of the oldest continual operating GM dealerships in the country. One day Fred Ferman the owner asked me to deliver a car to his BayShore Blvd home for his wife. Afterwards he asked me to look inside a new Olds Tornado he had parked under the portoco in front of the stately home. “See anything unusual “ he asked ? I saw nothing, then he pointed out the air bag in the steering wheel. It was one of the first ever installed by GM. Ferman is still operational to this day with numerous franchises . There are 2 photos of what looks to be the same car; it’s a ’46 to ’48 2 door Pontiac fastback. In photo #1 it’s the black car next to the corner of the building behind the GULF sign post. In the 4th photo you see what could be that car again; furthest car away on the right side of the photo.